Rockland schools, among many things, pride themselves on their extensive travel opportunities for students. 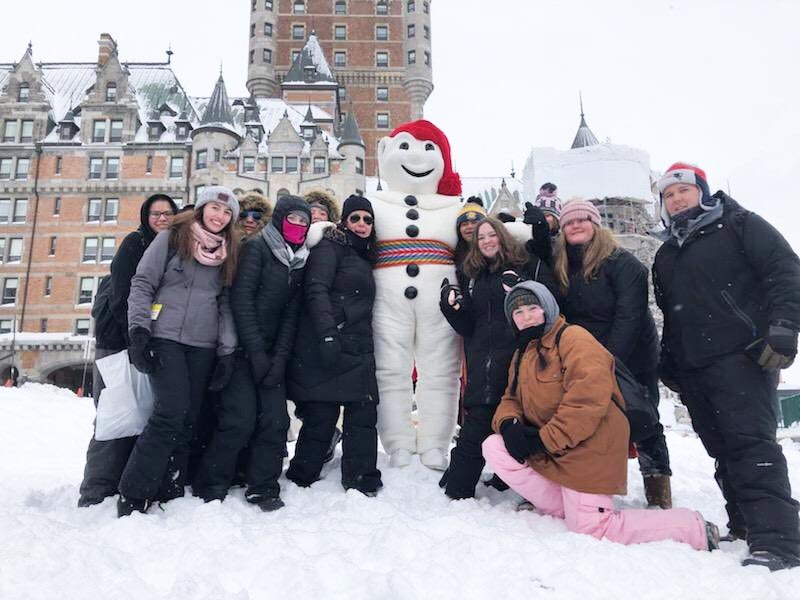 Rockland High’s recent journey to Quebec is one more addition to this list of experiences. With a group of twelve, Rockland headed to Quebec by an eight-hour bus ride, and stayed in the city for four days and three nights. The decision to merge our travel group with Hanover was primarily for financial reasons, as having more students on the trip greatly lowered the cost. Overall, the main purpose of the trip was to immerse the schools’ French students directly into the language and culture by interacting with French speaking people daily. Peter Harrison, RHS Transitions teacher also accompanied our group. Some of the highlights of the trip included tobogganing, snowshoeing, dog-sledding and tubing at the largest tubing park in North America. Despite the extreme cold that weekend with wind chills of -0 degrees, Mrs. Dore said that the students were dressed correctly and enjoyed the outdoor activities. Other activities included tours of the Hôtel de Glace, a hotel made completely of snow and ice, and the Montmorency Falls just outside of Quebec City. The falls are 272’ tall, 99’ higher than Niagara Falls. For me, the highlight of the trip was dog-sledding (or as they call it, traîneau à chiens) in the snowy hills. Some other memorable moments included our night spent tubing down huge slopes, Carol Lage and I clinging to our tubes, giggling the whole ride down. At the Hôtel de Glace in Quebec City: Back l to r: Nick Earner, Damon Welles, Gabe Fiorot, Patricia Ryan, Mrs. Dore, Jenna Whitten, Emma Krog, Ava LaBollita, Kaya Kelley. Front l to r: Mr. Harrison, Olivia Milso, Carol Lage, Rachel Laleme, Jess Dunphy.